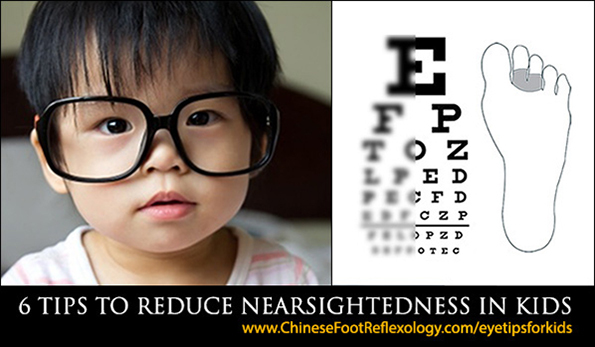 71 Responses to 6 Tips to Reduce Myopia (Nearsightedness) in Children — And Adults Too! Hello, i have A question, i am the one has macular degeneration at left eye, and at my right foots eye point, i have an terrible ache which is like there is a baloon and it tries to go out from that point. I think it is about the blood which is located at the back of my eye at yellow spot, and i do not know what to do with this pain. I think it is healing, because the gray area is getting smaller which is at the center of my vision. Do you remember, last year i wrote you about this and you wrote a long post to reply 😉 thanks again. In short, does massage helps to reduce to pain, and heals my eye? How will i get rid of this ridiculous baloon which slows my walking? I would recommend that you first see your doctor about your toe to rule out any serious issues. Ask them if it would be okay for you to practice reflexology on the area. If they give their approval, then I would recommend gently massaging around the area (as opposed to directly on it). Use a light pressure for a few seconds here and there throughout the course of the day. Restoring balance to your body begins by taking a balanced approach to healing. Apart from practicing these tips on a daily basis do you set aside a certain amount of time each day to do other eye improvement activities? I make eyesight improvement a lifestyle habit. It’s like being conscious of your posture. You don’t really need to set aside time, but just be aware of how you are sitting and holding your body. For vision, you have to be aware of how you are seeing. My 9 yr old boy has a degree of 200+ For both eyes. For the half an hour outdoor, should he wear his glasses? He should take off his glasses as much as possible, including outdoors. My four year old daughter has already started to wear glasses….reason being myopia. Her eye power are 3.25 and 2.75. We are really worried about her eyes. I request you to suggest some easy methods due to which she gets rid of her spectacles and gain 20/20 vision. Kindly help us in this matter. We are very much upset. Please help me by sharing tips on doin eye exercise. I would recommend practicing the tips in this article first. I haven’t finished reading this article of yours yet. But I just want to thank you!! Thank you for your kind heart to share your eye story with the world. My daughter is 10 years old and has myopia. I was trying to force her to do eye exercises (turning eye around and more) everyday. I am getting so frustrated with her everyday thinking her didn’t do right way. We tried so hard but didn’t really see improvement. I am so frustrated and searched the internet tonight when I found your website. Thank you so much with all my heart! If my daughter’s myopia gets better I will let you know immediately. Please also consider the importance of HOW you approach this with your daughter. Nearsightedness in children has emotional roots too, not just physical. People who are nearsighted pull into themselves. The myopia is a manifestation of not wanting to see what is going on in their lives. There may be something that your daughter finds difficult to deal with. Please provide lots of love and support for your daughter so that she sees more of your encouragement and love, as opposed to your frustration. Yesterday I learnt that my daughter’s vision has deteriorated from -4/-5 to -6/-6.5. I was feeling extremely helpless and worried. Then while browsing the net for possible solutions I chanced upon your article. I want to thank you for sharing this enlightening write up which I am sure will bring hope and courage to many disheartened parents. God Bless you. You’re welcome. My own vision was once in the -6.5 range, so it IS always possible for your daughter to improve her vision. My eye power is minus 7 and 7.5 can these exercises even reduce my power?? Well, you’ve clearly identified my first piece of advice, which is to read the article :). It’s important to start DOING these things. Many times people ask me for advice right after I’ve given advice, so the best advice I can give is to apply the advice in your life. I’d leave it at that for most people, but because you’re 12, I want to write more. When you have such a strong prescription at this age, it’s a sign that there are things in your life (either about yourself, family, school, or other influences) that you really don’t want to see. You didn’t mention if you were nearsighted or farsighted. Someone who can’t see far away is pulling into themselves to hide from what they don’t like seeing in their life. Someone who can’t see things up close is pushing everything that they don’t want to see away from them. Aside from wearing your glasses as little as possible, spending more time outside (without glasses on), and minimizing your time on the computer/tv/tablet/phone, the best advice I can suggest is looking inwards. What is it that you do not want to face about your life? Then, go find someone you can talk to. Maybe a teacher at school. I won’t say guidance counsellor because they were useless when I was in high school, but perhaps you have some good ones at your school. A friend’s parent, a trusted adult, your parents? Even an online group or teen phone helpline? I’m not the one to help you with what’s going on in your life, but I am the one to tell you to find someone who can. When you see yourself and your life with love and compassion, then your eyes will stabilize. Dear Holly I wonder if your vision was -6.25 and -6.75 so after these exercises which you mentioned in your article how much improved your vision now? And also how long it took till you felt that your vision and myopia improved ? My last eye prescription (2014) was for -1.25 and -2.50. This was under ideal conditions, and my vision can fluctuate by as much as 1.00 diopter depending on whether I’m tired or well rested, the time of day, the activities I’m doing, and how conscious I am about “stretching” my eyes. In the beginning, I noticed an improvement of about 0.25 diopters every 3 months. At a high prescription, this is almost unnoticeable. However when using the computer up close with a reduced prescription (at first -0.25 less than prescribed), I noticed things were becoming clearer. As I got the hang of improving my vision, I reached periods where I was seeing an improvement of 0.25 diopters per month, although every two months was more typical. I would say there is a noticeable improvement (one you can see in your regular day) for each 0.75 to 1.00 diopters. Right now, I seem to have plateaued for a few months, but I attribute this to 2015 being a chaotic year (family moved to a new city, and I had a looming deadline for my book). As a result, I put the vision improvement on the backburner. Plus, I had also reached the point where my prescription was close to when I first started wearing glasses. The final tenacious emotional and energetic blocks need to be released for me to transcend this hurdle. Hey I started wearing glasses yesterday. Now every one told me that I should wear them all the time . But I don’t know because every time I wear them I have a sever pain the head . Besides they have absolutely no change in the close stuff like reading orplaying vedio games so what should I do ? When to put them on and when not to ? Btw I’m 23 and I read alot due to the fact I study literature and mythology in collage. It sounds like you know the answer inside your heart and body already. Listen to YOU because you’re the one who has to live with these eyes for the rest of your life. Who is telling you to wear your glasses all the time? Are they wearing glasses? Personally, I would not take financial advice from someone who is broke, nor health advice from someone who is unhealthy. You have a mild prescription and as you’ve noticed, you can see clearly up close without needing the glasses. I would recommend less video game time and more outdoor time to help keep your eyes strong and healthy. Also, since you have to read so much, take eye breaks where you take your eyes off the page every 15 minutes or so and “stretch” your eyes by looking out a window. Hi Holly, I just started massaging the eye areas on both my feet. I feel quite intense pain on my left foot and almost negligible pain on right foot. Why is that so when my left eye myopia degree (600 degrees) is much higher than my right eye’s myopia (450 degrees)? I thought I should be feeling more pain on my right foot area instead? For myopia in both eyes, the pain would be equal on both feet unless there was a HUGE difference in your prescription (e.g. -0.50 vs. -9.5). Do you have astigmatism? There are also “hidden” areas on the toes that people often overlook. If you press along the edges and below the toe pad, you will likely uncover more sensitive areas. Keep up the regular massage as it’s good for your eyes, and Chinese Reflexology is most beneficial when practiced regularly. Hey Holly thanks so much for your encouragement that really inspired me because I too started putting on lenses at 11 and its been 10 years today and its still not getting better and am supposed to go for a new pair in February but for fear of being prescribed a larger number and thicker lenses I decided to scroll the net lo and behold I fell on your article right now am like if she can see properly after 30years why can’t I after 10 years….starting today am following your therapy in hope that I regain my normal sight thanks once more. This is the start in the right direction. Practice regularly, and when you are able to make that commitment to your healing, then you are ready to move on to the next steps. Your article is so encouraging and optimistic! Its been only one day that I started your direction… Since you mentioned only 2/week I’m waiting out the second day… So start off for 15 sec… increase it up to a minute only twice a week, right? And take off glasses while outdoor- will it not have an adverse impact on the already high prescription ? (-6 and -7)Could you explain the reason behind taking off glasses while in the outdoor…. Thanks- will be waiting for your reply. If you read about the Bates Method, you’ll learn that his theory for the reason why people need eyeglasses is because certain eye muscles are too tight, while others are too weak. The result is that the eyeball is stretched into an elongated shape, causing myopia. When you wear glasses, it corrects for the blurriness, but in order to see clearly while wearing the glasses, the eye muscles must continue to hold the eyeball in the incorrect shape. Thus, when you remove the glasses, it allows the muscles to relax and stretch out, and also gives you the chance to strengthen the weaker muscles. I saw this reply only today! but now after reading your reply and reading about the method, I will follow it as recommended. Thanks for the valuable information.I am high myopic having -10 and -12 and age of 25.please confirm if this massage is also beneficial for me. You’re not healing your eyes, you’re just forcing your eye muscles and you will be going blind within a few years because of that. You probably noticed that you have more frequent headaches now as well, even if you made no mention of this, this is the cause. Thank you for sharing that you should not be forcing your eye muscles as that could indeed lead to headaches. The focus should be on relaxing your eye muscles to reduce strain and allow qi and blood to flow easily to and from the eyes. I’d also like to mention that I have not experienced getting more frequent headaches, most likely because I don’t force my eye muscles. That’s a good point your bring up as I should have stated that in the article. And if it is not clear in the article, then please allow me to make it clear (bad pun intended) that I have optometrist and machine-tested (no bias) eye prescriptions that show an improvement in my vision. These improvements have occurred over the course of five years, so it’s not an instant fix. But to me, it’s been a worthwhile journey and much better than seeing people the same age as me having to get bifocals. But my eye power is so high. Left-8:50 (based on my contact lens) and Right-9:00 (contact lens). Is it okay for me to take off my glasses because I can hardly see things. I would recommend taking off your glasses in situations where you don’t need to see clearly. E.g. sitting at home, talking with friends, listening to music (even sitting on the toilet!). Thank you for this wonderful article! Every single night I have been so stressed wondering if my eye grade will become worse. I have 8.00 and 5.75 (I am still 15.) and it is not really the exact one since I am experiencing blurriness even I am wearing my glasses. My parents are not motivating me though. They are so negative saying I am going to blind,I ain’t going to have a perfect vision, whatever nonsense they say. But this article says otherwise, gave me a motivation and positivity to start stepping up my game. Maybe this will help me reduce my eye grade even just a little bit. So once again, thank you. Maybe I’ll start doing these steps/tios right now! It is not normal to have a few headaches, so it does sound like you are trying to hard. Remember it is about RELAXING the eyes. It will be normal for things to not be clear when you are not wearing your glasses. Let go of the need for being able to see clearly, and then over time, you will actually be able to see more clearly. But if you try to force it, you will strain your eyes, which is counter to improving your vision. How can I actually relax it? I kind of stopped the exercise for a while because i am worried because it gives me few headaches. Right there in what you’ve written is how to relax :). Try not to worry as much. If you are just sitting and doing nothing, then you do not need to strain your eyes to see anything. Take some time to just relax, not just your eyes, but your whole body, and your mind too. my 2.5 yrs old daughter was born preemie ( 25wk) and has strabismum along with myopia, yesterday on her eye doc visit he recommended prescription glass for her -2 and -5 ( left eye which occasionally drifts outwards). when we read online it says myopia will keep on progression as she grows older and we as a parents are really worried for her. not to mention my wife had myopia from birth and was -8/-10 untill age of 25 when she had lasik. Please educate us as in what way we can do best to stop her vision getting worse. is going out everyday in sunlight is best bet of we have at this juncture. also doctor recommended her to wear the glasses all the time and asked to see her back in month time. Please follow the article suggestions for yourself and your daughter. Thank-you for being such a strong advocate for not wearing glasses as the best way to heal vision. My myopic is -1.25 and -1.5 (which isn’t a lot!) But its still enough to struggle to see. I feel like my range of clarity is closing in (but I won’t take that as a reason to give up this pursuit!) Do you have any other suggestions as to what I should do? I was wondering if you were experiencing floaters around the time you were healing your eyes.I am experiencing floaters and was wondering if these excerises would stop the floaters.If not I was wondering if you had anything that would stop or lessen the floaters.I was also wondering if you experience any headaches or such pain during the healing.Is that a sign of the eyes getting better?Also what are the signs of the eyes improving?Besides the obvious vision changes and such.Also I was wondering if the healing would be permanent like if I was able to get my eye perscription down would it last for a long time? Sorry for the abundance of questions but please do reply. Hello! To answer your questions, I did not experience floaters. I only experienced headaches once and that was the first time I reduced the prescription on my eyeglasses. It was so unknown to me to get used to weaker glasses (normally you always get stronger glasses). After I let go of trying to make everything crystal clear and accept the slight blur, I never experienced headaches again. My vision fluctuates by a range of about 0.5 to 1 diopter, but the overall trend is a reduction in my prescription, and it continually improves. 1) Would morning sun be any better or evening would just be as good? 2) While at point 6, should I start with the 2nd toe or the 3rd toe? 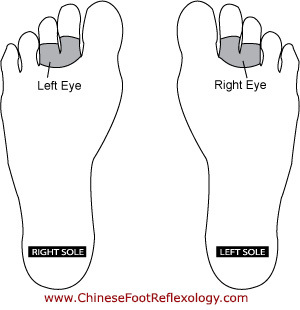 Same for both the left and right toe? She allows me to massage her toes for 15secs… Should I do this once daily and when I gradually reach 60secs, I’ll just do this twice a week? As I am also short-sighted (similar to yours) myself, I am also trying out some of these and encouraging/accompanying her. I plan on writing a follow-up article on the importance of mindset for seeing, and how parents can help their kids. I announce new articles in my newsletter, so if you’d like to be notified of when I post this, please sign up for my monthly newsletter. Is it really possible to reduce your myopia in a certain method which you will not use your eyeglasses? Many of my classmates with glasses are always saying to me that their eye specialist says that we must wear eyeglasses as much as possible. How long would this procedure take? I’m having a panic to my eyesight because every time I consult my doctor, they’re adding a degree of 50 and 75 to my glasses and I’m just a 13 year old with a degree of 350(left) 325(right). I hope you can help me with this matter especially I’m really having a panic every time I think about my future if I’m a blind person. I have reduced my myopia from -6.25/-6.75 to less than half of that. I really don’t know what the actual prescription is as my eyes keep improving every few months. Right now, I go about confidently without wearing my glasses most of the day. I have started to be able to read the menu board at Starbucks without my glasses, and I remember a few years ago, I could not even tell there were words on the board if I didn’t have glasses on. The only time I wear glasses is to drive and in dimly lit places where I need to see (e.g. walking in an underground parking garage, at a hotel conference). Most eye professionals say this is impossible, but I see with my own eyes (literally) that it is possible. It has taken me over 4 years to reduce my prescription by this much, and I’m fine with that. At my age, most other people are experiencing worsening eyesight, so I’m happy to see my vision improve. You are still very young, so your eyes are more responsive than older people and can heal much more quickly. You will need to change how you see yourself and your life in order to change your vision. You need to stop panicking and instead find more peace. Try meditating, find books on law of attraction, try a relaxing sport, read The Secret and The Magic. When you love yourself and your life, your body does not need to manifest reasons for you to not see clearly. Also spend more time outdoors and less time on computers, TV, phones and tablets. Good luck! Hello Holly thanks for your article so much. I am a 19 year boy.I am suffering from high myopia with -11.25 power in my both eyes.I had an eye operation in my right eye due to retina detachment .now I can hardly see with my this eye.can you help? Can you share some tips to reduce my spectacle number as well? And is it safe to massage my left leg with Chinese reflexology. ?please please help..
You will need to change how you see yourself and your life in order to change your vision. You need to stop panicking and instead find more peace. Try meditating, find books on law of attraction, try a relaxing sport, read The Secret and The Magic. When you love yourself and your life, your body does not need to manifest reasons for you to not see clearly. Also spend more time outdoors and less time on computers, TV, phones and tablets. All the best! Hello Holly sorry to ask you another question . Does eating something daily or avoiding something could help in reducing the spectacles number? I don’t bother with eating special foods, so I really can’t comment on this. I’m sure there’s a lot of info on the Internet on foods and supplements. I focus on eating healthy in general and getting a variety of foods. I am going give your methods of improving my vision a try. My left eye is -7.25, my right -7.5 and my reliance on my contacts and/or glasses has been 100%. I now notice that they have gotten worse lately (I am 56) but I don’t want to go to my optometrist and get a new prescription for something stronger. When I was 9 and got my first pair of glasses it was terrible as you mention, back then glasses were thick and looked horrible. I was called 4 eyes by my peers and became very insecure and self conscious about it. It really changed my life for the worse. Going to the beach and swimming by myself for example was awful…I couldn’t find my way back to my family, the entire beach was just a blur. It is better late than never, I have to make a effort to improve my eyes. Taking my glasses off, trying to focus at distant objects, exercising my eyes like any muscle has to help, it makes sense. And I will try the foot massage as described as well. I’ve nothing to lose! I am glad I found your article Holly, thanks so much. Good for you for giving it a try. I know EXACTLY what you are describing about going to the beach and not being able to see anyone to find your way back. Honestly, it wasn’t until I reached the -3.00 range that I started to notice an improvement in being able to pick out people from a distance. Everything is still blurry, but much LESS blurry. I’ve recently been able to make out menu items on the Starbucks menu, which I’m celebrating as a huge victory! Vision improvement is a slow and steady process, but I have found it to be an entirely worthwhile journey. As you say, you’ve got nothing to lose! It’s been about 4.5 years now, and I’m seeing my eyesight improve whereas friends who are a similar age are getting bifocals. I’ll choose this journey over that–thank you very much! I read your website, and it was pretty interesting. Most of the websites were about Ebooks or PDFS that you had to purchase off of them. I’m 13 years old, and in grade 7. I’m graduation in a few weeks. I really want to get my eyesight better, and stop it from growing too fast (the power) I meant. I just don’t want to go to sugery or live the rest of my life not being able to see what others can see clearly. I’m afraid that it might get to -10.00 or more. I have some questions to ask, if you don’t mind, of course. You don’t have to, but I would really appreciate it. 3. Should I get OPK? It’s the contact lense that you put on at night, and when you are sleeping, it focus your eyes. Ah, I think you already know what my recommendation will be based on your second question. You need to spend less time online and more time outdoors. If you are online, at the very least, do some stretches, look away into the distant every 15 to 20 minutes, and take more rest breaks. Hey! I have a few questions, since the article stated that you need to take off your glasses outside, so it means that i should not take of my glasses when I am at home? Because I have tried your tips but started taking off my glasses indoors (at my home) today and it gave me headaches. Maybe that was the reason of my headaches or are there many reasons beside from that? And also how many days can you think will an eye grade can be reduced? My eyeglasses prescription is veryyy low because it is old already and my vision started to blur again but i hope your tips help. Sorry for asking too many questions. I am just eager for an improved eyesight atleast. Have a nice day and thank you! Headaches are caused by eye strain. It’s important that when you take off your glasses, you’re relaxing and not trying to bring things into focus. Improved focus won’t happen until you first learn to RELAX the eyes, and it will take months for this to happen. So the best thing to do is to actually RELAX when you are taking off your glasses so that your eyes can relax too. I am engineering student and I have to work on computer on regular basis its very difficult for me to read on computer screen when I am not using contact lenses…..
You may not like my suggestion! I would recommend switching to glasses. Then, you can periodically take off your glasses, and massage your eyes while working. Also, stretch your arms, roll your shoulders, turn your head. If there is a window, look out the window every 15 to 20 minutes for a few seconds. Otherwise, look as far away as you can (without glasses on), or close your eyes and imagine yourself looking off into the distance. Hi Holly, I read your blog and comments, and had an enlightenment after you said myopia at a young age occurs due to children pulling into themselves to hide from things they don’t want to see. This is very true of me – I’m 16 years old, I grew up with and am still experiencing a really rough childhood, my family and financial situation is really bad and it has taken a toll on my emotional and mental health. I started wearing glasses at the age of 5 (this is why I had the enlightenment – coincidentally, things started getting bad when I was that age) and my prescription now should be around -10.00. I have quite bad astigmatism as well. School is not helping much as I sit at a computer or stare at books all day – there’s really not much time for me to take many breaks.